KSiteTV's Craig Byrne looks at 12 shows he's looking forward to seeing in 2012. 2012 is almost here, and in some parts of the world, it has already begun. Here in California, as I type this, there are several hours left, and thus, there’s still time to talk about what I’d like to see in the coming year. The new year is the first one since KryptonSite started where there won’t be new episodes of Smallville to look forward to. But thankfully, television is not a wasteland, and there are some great shows (and returns!) to come in 2012. Here’s what I will be looking forward to, in no particular order aside from the status of the show. Smash (NBC) – I wasn’t sure if I’d be into Smash when I saw the initial promo trailer from NBC. Thankfully, NBC sent along a screener of the pilot, and it was AMAZING. My worries about it appealing only to a limited demographic were definitely wrong. Fantastic music, a great cast… NBC finally looks to have something new that’s actually good. One thing I will warn you about, though – as soon as you’ve seen Episode 1 you’re going to want more as soon as possible. Alcatraz (FOX) – I’ve also been able to see this one, and went to the set in early October. I’ll be posting more about that trip as the show approaches. Basically, it’s kind of a “what if” type show where criminals from Alcatraz Island in the early 1960’s disappear and end up resurfacing today. It’s from the JJ Abrams production shingle, so it should probably not be surprising that there are some surprises within. Jorge Garcia, Sarah Jones, and Sam Neill star. Dallas (TNT) – We’ve got to wait until Summer 2012 for this one, even though TNT has already been publicizing it heavily. In a world where classic TV series are being remade, Dallas takes a different approach, instead serving as a sequel to the original show with series stars Larry Hagman, Linda Gray, and Patrick Duffy all present for the new version. I’m pretty confident that a new take on Dallas will be just as addicting as the original show. The original Dallas was so generational, that it’ll be neat to see what happens to the ranch that once was home to Miss Ellie and Jock back in the day. Summer can’t come fast enough. Don’t Trust The B**** In Apartment 23 (ABC) – This show features Dawson as himself. How cool is that? Really, though. This is another where I’ve seen the pilot and loved it, and now I want to see more. If you loved New Girl, you’d probably love this, and in some ways it even moves beyond New Girl territory as the “b**** in Apartment 23” isn’t nearly as much fun as Jess… she’s just evil, walks around naked, and is BFF’s with Dawson. I don’t believe ABC has set a premiere date, but when we do see it, it’s worth tuning in. Touch (FOX) – I haven’t seen this, and I do think some of the promotional trailers have looked pretentious, but Touch could have the potential of being something wonderful like Heroes when it started. Then again, it could also have the potential of being like Heroes Season 4. Heroes creator Tim Kring is behind this project, which stars Kiefer Sutherland (24). The Lying Game (ABC Family) – Ringer what? In a world where The CW’s twin-show seems fairly inaccessible despite having Sarah Michelle Gellar, ABC Family’s twin take is far more addicting and inventive with an appealing cast that includes Alexandra Chando, Adrian Pasdar, and former Supergirl Helen Slater. Although Ringer has some great actors in its cast, it seems too much is put on the shoulders of Ms. Gellar; in The Lying Game, there are so many good characters that it’s possible to pick a favorite who isn’t named Sutton or Emma. When we last saw The Lying Game, Sutton appeared to be drowning and a new visitor came out of the shadows. What’s coming next? We’ll have to see, but what we do know is that Buffy’s Charisma Carpenter is coming on to the better of the “twin shows” when it comes back in early January. Once Upon A Time (ABC) – By far my favorite new show of Fall 2011. The series returns January 8, and from there we see what happens in Storybrooke following the death of one of the show’s characters. We also get to see more now that we know that Regina seems to know and remember very well that she was an Evil Queen. The writing on this show is top notch and I can’t wait to see more. 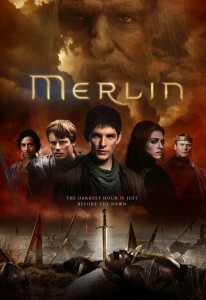 Merlin (Syfy) – The fourth season/series has already aired overseas, but here in the United States, it all begins on Friday, January 6. Without repeating any spoilers, I think there are going to be some major show-changing moments. I hope Merlin telling Arthur the truth about himself is one of them. Additionally, I’m definitely looking forward to seeing what The Vampire Diaries, Teen Wolf, Nikita, The Secret Circle, and Degrassi bring us in 2012. Clearly, I have the TV-viewing tastes of a teenage girl. There are a lot of projects in development that may not even get to the pilot-shooting stage. Here is what I’m looking forward to the most in that department. Because I’m me – this probably won’t be surprising, either – all four of my picks are comic book adaptations. Booster Gold (Syfy) – “Booster” was one of my favorite episodes of Smallville’s final season, but the lower ratings for the episode made me think that we’d probably never see him in live action again. Fortunately, I was wrong. 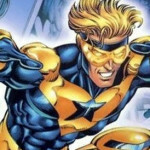 Syfy is developing a Booster Gold show with Andrew Kreisberg – writer of the classic Justice League episode featuring Booster, “The Greatest Story Never Told” – as the writer. A witty character like this with sci-fi trappings? Sounds perfect to me, and it sounds like a great fit for Syfy. The Hulk (ABC) – Like AKA Jessica Jones (which I think would be great, though I could see Hulk being a bigger name and priority), The Hulk is based on a Marvel Comics property. Guillermo del Toro is involved with this TV adaptation, which would surely also feature the talents of Marvel TV head Jeph Loeb (Heroes, Smallville). Although a character like The Hulk would skew male on a network that is mostly aimed at females, I could totally see ABC turning Sundays into a fantasy night, with Hulk going before or after Once Upon A Time. If Marvel wants to make an impression on TV like DC did with Smallville, they’ll have to come in with the big names and The Hulk is one of their biggest. I hope this happens. I hope for AKA Jessica Jones too, but I’ll save that one for a future list. Mockingbird (ABC Family) – Not much has been said about this ABC Family adaptation, also of a Marvel comic. Mockingbird was one of my first “favorite” super-heroines on account that in the comics, she ended up married to Clint Barton, better known as the Avengers’ Hawkeye. Sadly, the comics often pair her as part of the second half of “Hawkeye and…” but when explored, Bobbi Morse is quite interesting herself. The college student-spy thing may have been covered before with Alias, but I think this could also be a good TV fit, mixing comic book action with the kind of teen drama ABC Family is famous for. Since Mockingbird hasn’t really been mentioned more than at a convention or two, we’ll see if this actually happens in 2012. I’m hopeful. 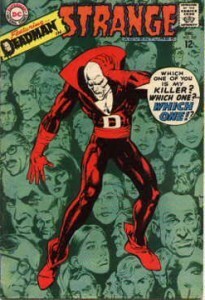 Deadman (The CW) – Supernatural’s Eric Kripke is developing the DC Comics character Deadman for television, although who knows if it’s still in progress, now that Kripke is also doing the high-profile Revolution with JJ Abrams. CW head Mark Pedowitz says he wants to bring another DC Comics character or franchise to TV, and although Deadman may not be the highest-profile choice, a character like that might have less expectation and thus be good for TV. If they go with a pitch that is more like the original concept – at the core, man is killed and searches for his killer; the inhabiting bodies thing is just a bonus – it could be a good thriller for a network that still needs more hits. Honorable mention goes to possible TV adaptations of The Punisher and The Spectre for FOX, pending more information about those projects. So there you have it. Who knows if any of the development shows will make it in 2012, but at least I know those new and returning shows up above will hit my TV screens. Hopefully, they won’t let me down. And who knows? Maybe word will come out about even cooler stuff planned for next year. I also know that inevitably, this list will be published and I’ll forget something that I’ve been looking forward to. I’ll apologize in advance for that. There are also some great shows like ABC’s Revenge that I admit are omitted from this list because I still have to catch up on what has aired thus far. And to all on you reading – have a great 2012! !